The perfect balance of salty and sweet. 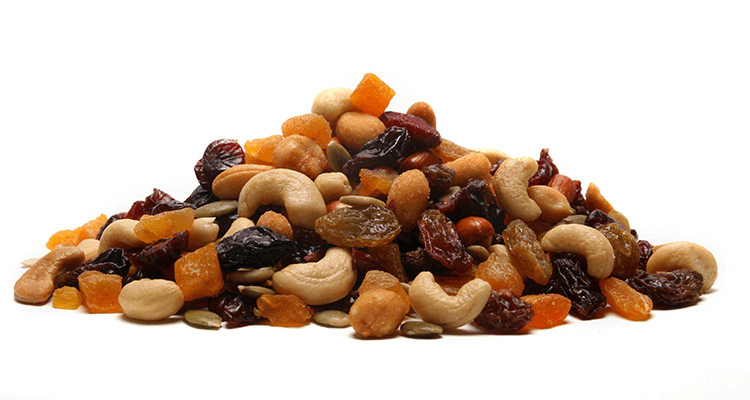 Salty mixed nuts blended with the sweetness of dried fruit. Jumbo Raisins (Raisins, Preservative (220 (Contains Sulphites))), Roasted Cashews (Cashews, Sunflower Oil, Salt), Diced Apricots (Apricots, Rice Flour, Preservative (220 (Contains Sulphites))), Dried Cranberries (Cranberries, Sugar, Sunflower Oil), Honey Roast Peanuts (Peanuts, Sugar, Honey (6%), Vegetable Oil (Peanut, Soybean), Salt, Modified Potato Starch, Maltodextrin, Stabiliser (415)), Roasted Redskin Peanuts (Redskin Peanuts, Sunflower Oil, Salt), Pumpkin Seeds. Contains peanuts, soy, sulphites and tree nuts. May contain traces of egg, gluten, milk, sesame seeds and other tree nuts.